The West End Civic Association (WECA) will welcome representatives from Delaware North and Boston Properties to present an update on The Hub on Causeway project, specifically the new hotel, supermarket and movie theater at their May meeting. WECA will also update attendees on what we have accomplished in efforts to control the proliferation of AirBnBs and illegal rentals in West End apartment buildings. The meeting will be held Thursday, May 10th, at 7 p.m. at The Hawthorne Place Community Room, 2 Hawthorne Place. Seating is limited; doors will open at 6:45 p.m. Refreshments will be served. All West Enders are welcome. 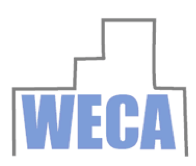 If you are not yet a member, consider joining WECA. Help us ensure that our residents’ needs are brought to the attention of our city government. Please join us in helping protect the future of our West End neighborhoods.